You’ve done it! You passed the first interview with flying colors, and you just got a call or an email to schedule a second interview. It’s important to be aware that the company is seriously interested in you, or they wouldn’t have called you back. You’re definitely in contention for the job so here’s what you need to know so you can ace your second interview. Get the Agenda: Sometimes, a second interview can be a day-long interview. You may meet with management, staff members, executives, and other company employees. For example, at some companies, the second interview process involves meeting with people from different product groups. Candidates usually meet with four or five people who are geared to provide an idea of what it’s really like to work for the firm. Ask the person who scheduled your interview for an itinerary, so you know upfront what to expect. Research, Research, Research: Take the time to do some research and learn everything you can about the company. Review the About Us section of the company website. Use Google and Google News (search by company name) to get the latest information and news. Visit message boards to research what’s being discussed. If you have a connection, use it to get some insider information on management and staff, as well as the company in general. Review Interview Questions and Answers: You may be asked the same questions you were asked during the first interview. Review the questions you were asked in your first interview and brush up your responses. In addition, review any additional questions you may be asked during a second round interview and have another set of interview questions ready to ask the employer. Like the first time around, it’s good to take some time to practice interviewing, so you’re comfortable with your answers. Think About What You Didn’t Say: Was there something you thought you should have mentioned during your first interview? Or was there a question you had difficulty with? The second interview will provide you with the opportunity to expand upon your responses from the first interview. Be Prepared for a Lunch or Dinner Interview: When you’re scheduled for a full day of interviewing, lunch and/or dinner may be included on the agenda. Dining with a prospective employee allows the company to review your communication and interpersonal skills, as well as your table manners. This is still part of your interview, so it’s important to dine carefully. The last thing you want to do is spill your drink (non-alcoholic, of course) or slop food all over the table. Order appropriately and brush up on your dining skills, and your table manners. Ask Questions Before You Go: When you’re invited to interview a second time, the chances are good that you are in contention for the position. It’s appropriate to ask for a copy of the job description to review, as well as to ask about the organization structure and how you will fit in. 1. Keep up your energy and enthusiasm throughout the visit, which may last anywhere from two to eight hours. There may be a series of meetings or interviews with individuals and small groups. Each person will be evaluating you independently and accessing both your motivation to work there as well as your qualifications. Try to make a fresh, energetic impression in each session even though you may be fatigued or bored about answering the same questions. 2. Be prepared to answer variations of the same questions which you might have responded to in the initial interview in order to prove your fit. Your first interviewer probably didn’t transmit this information to other colleagues so be ready to say why you’re interested in the role and to relate how you have the knowledge, skills, and personal qualities that will enable you to succeed. 3. Be concrete when discussing your qualifications. Make sure you have specific examples of how you’ve utilized your strengths to meet challenges and achieve success in past courses, volunteer work, jobs/internships, projects, and campus activities. 4. 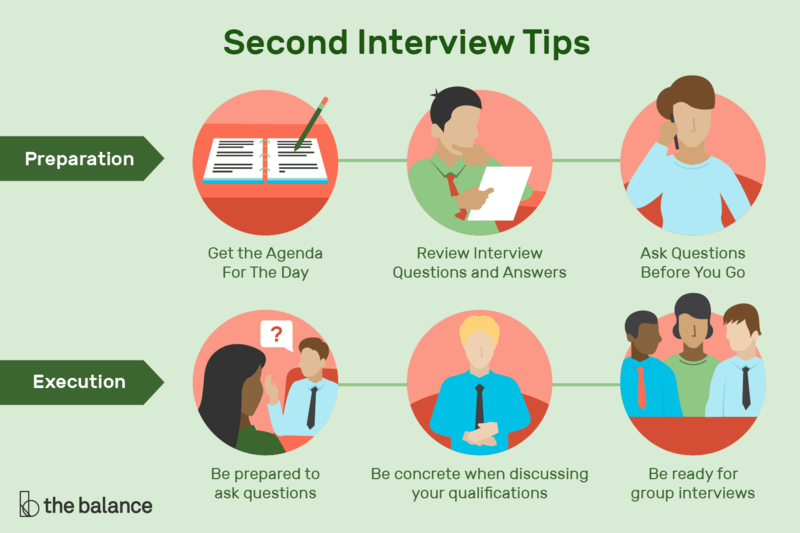 Be ready for group interviews. The natural tendency, when interviewed by several people, is to focus your delivery on the most approachable or comfortable interviewer. Make sure that you make eye contact with all your interviewers and direct your responses to all members of the interviewing group. Each person will have a say in your final evaluation, and some of their assessment will inevitably be influenced by whether you developed a rapport with them. 5. Don’t forget that you are always being evaluated even when individuals are not asking you probing questions. You will often have the opportunity to meet with recent hires, perhaps for lunch. These folks will be asked for their impressions later on so don’t let down your guard. 6. Some site visits involve group activities like case analyses or social receptions where you might interact with other candidates. Employers will use these situations to assess your ability to work in groups. You will need to showcase your leadership skills and finesse with people to succeed in these sessions. Drawing consensus, including others, and listening, will be valued in addition to any astute statements and creative solutions which you might offer. 7. Be prepared to ask questions and show an interest in each person with whom you meet. Examples include what they enjoy most about their role, a summary of their career path with the organization, the biggest challenge faced by their employer at this juncture and what they think is necessary for one to succeed in the job for which you are interviewing. 8. Send a follow up communication to as many individuals with whom you’ve met as possible, and do so immediately after your meeting. Make sure you get business cards from everyone or ask your visit coordinator to share that information. If you really want the job, try to write something different in your email or letter which relates to your conversation with that individual. That way they’ll realize you are making an extra effort which will prove that you are a hard worker. 9. Make sure it is clear to all involved that you really want the job and you and the company would be an excellent fit. All things being equal, the most motivated candidate (without seeming desperate) often has an edge. 10. Maintain occasional communication with your prospective employer in the time following the interview. Relay any updated information about accomplishments and awards. It often can be a matter of just checking in to reiterate your strong interest and see if there’s any update regarding your status. Decide if the Job Is Truly a Good Fit for You: Sometimes, whether a particular job is a good fit is hard to define. If something is telling you that you are not sure about this job, listen to it. You don’t have to turn down the job, but you can ask for additional meetings with staff, especially the people you are going to be working with, to make sure the job is a good fit for you. What to Do If You Get a Job Offer: In some cases, you may be offered a job on the spot. You don’t have to say yes or no immediately. In fact, it makes more sense not to say yes right away, unless you are 110 percent sure that you want the job. Everything may seem perfect while you’re there, but, once you have a chance to mull over the offer and the company, it may not seem as wonderful.